INDIANAPOLIS – Each year, the Indiana Ready Mixed Concrete Association (IRMCA) honors an individual or individuals who have unselfishly given of their time and energies to advance the interests of the IRMCA and the concrete industry while demonstrating this dedication through strong participation in the organization. 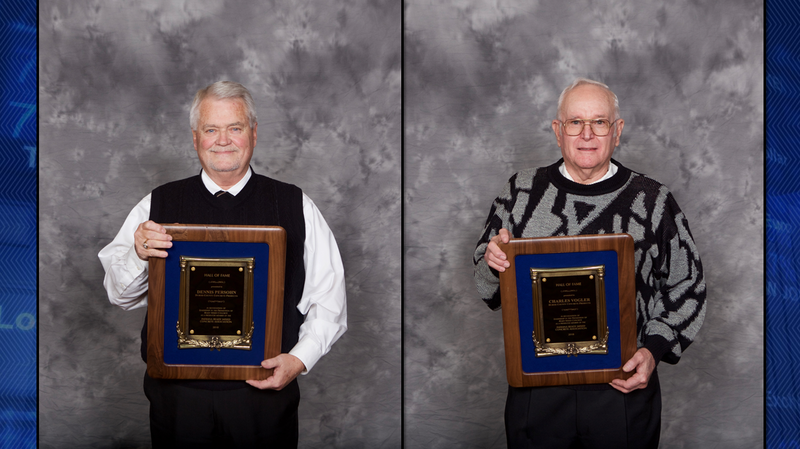 This year’s IRMCA Hall of Fame inductees are Dennis Persohn and Charles Vogler. The award ceremony was held earlier this month at the Crowne Plaza in Indianapolis, Ind. Mr. Persohn and Mr. Vogler, residents of Jasper, Ind., are owners of Dubois County Concrete Products. In addition to being members of IRMCA, they are members of the Builders Association of Dubois County. Mr. Persohn is married to wife Irene and has three children: Brad, Bruce and Bart. Mr. Vogler is married to wife Eileen and has two children: Sharon and Kevin.